Double doodle art is fun, relaxing, and a great way to exercise the brain as it uses both sides of the brain simultaneously. Here’s how, plus some examples. I was first introduced to the concept of double doodle art years ago by Maya Donenfeld of Maya*Made. She wrote about a mesmerizing drawing exercise her daughter learned at school from an art teacher. We gave it a try, loved it, and have been doing it ourselves ever since. I’ve included double doodle drawing in both my books (brief mention in the first, longer write-up of the activity in the second), but have never written a blog post about it, and thought it was about time I shared one of our favorite drawing exercises here. Here’s a video I made, showing double doodle art in action. Basically, you’ll draw simultaneously with both hands and markers, creating symmetrical, mirror image drawings. Here’s what I wrote in The Artful Year (pages 39-40). Holding a marker in each hand, place the tips side by side at the center of the paper. Begin drawing with both markers at the same time, creating a mirror image. For example, when the left marker is heading left to the edge of the paper, the right marker should be heading right to the other edge of the paper. When one marker is heading toward the center, the other should be as well. Note: If you need help keeping the paper in place (for little ones, especially) you can tape the corners of the paper down first. Maia double doodled entire scenes. Daphne got super into her double doodles and did drawing after drawing, including Easter eggs, a spider web, and some abstract art. Harry really got into it, too, drawing detailed starfish, sand dollars, and other designs. I did a few myself, too, including an Easter bunny, portraits, and some abstract double doodles. I hope you give double doodle art a try, both yourself and with your kids! It’s fun, relaxing, and a great way to exercise the brain as it uses both sides of the brain simultaneously. I love this idea! I will be using this for sure in my art classes. What a wonderful activity for a whole class or even a short warm up exercise. Thanks very much for sharing! You’re welcome, Fiona! :) Hope your classes enjoy it! This is wonderful! 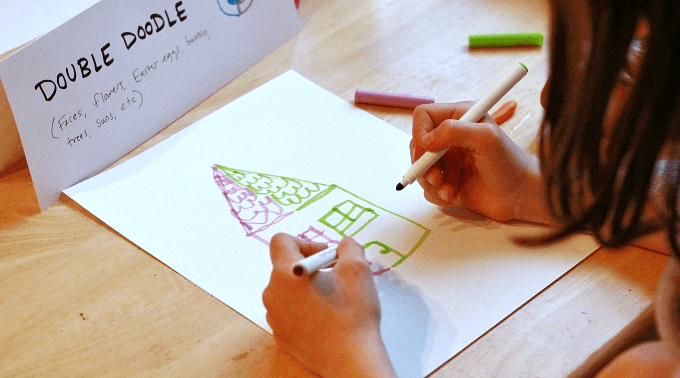 I am a pediatric occupational therapist and a licensed Brain Gym and Double Doodle Play instructor … Double Doodle is a fabulous way to help kids develop all sorts of visual motor and visual perceptual skills, and is by far the most often requested activity by the kids in my practice. I wanted to add that Double Doodle is part of the Brain Gym® program (Educational Kinesiology Foundation, Ventura,CA), and one of “The 26”, the core Brain Gym movement activities. Just in case anyone is wondering about the origins – You can find more information at http://www.braingym.org. There is actually an 8 hour course offered thru braingym.org that teaches all sorts of variations as well as much of the theory behind the activity. Happy doodling! I’m a post-doctoral fellow in neuroscience and received my PhD under the advisement of a professor who specializes in the study of how different cognitive processes may be lateralized more to one hemisphere of the brain or the other. I just have to comment that there is nothing special about this activity that “activates both sides of the brain”. EVERY activity engages both the left and right hemisphere. I’m not saying that drawing with both hands at the same time isn’t fun, or worthwhile as a new kind of art class activity, but I cringe to see it legitimized with pseudo-science. That goes for Brain Gym, too. At our neuroscience education workshops we point out BrainGym as a method that particularly exemplifies the misapplication of neuroscience findings. I was fascinated by this concept!! I used upside down drawing in my art classes, but I think this would be a terrific addition. I am retired now but still keep my intrest in art going as I have a four year old great granddaughter who is needing my help now. Sadly, I haven’t painted in quite a while, as I have had the roll of caregiver the past six years , for first my husband ,then my mother. They have passed away, but I’m not back in the painting mode as yet, but still trying to keep in the art loop. I’ll get back to it one day. Thanks for this idea. Very interesting exercise, even for adults. Thank you! I recently found a similar exercise (https://www.etsy.com/shop/ArinaKarZo). My kids really like DOODLE DOUBLE ART !!! I can’t wait my daughter to do this.. This is what I usually d when I was in elementary school, it helps me more creative and can be focus on science and art. Thanks for the idea.. I hope you and the kids enjoy it, Valentina!